Strawberry cla-what-is? A clafoutis (pronounced cla-foooooo-teeeee) is basically a breakfasty, custardy, pancakey, fruity oven-baked square of goodness. It's similar to a Dutch baby, which is one of my favorite breakfast treats, so I've had clafoutis on my Foodie To-Do List forever. With last weekend's strawberry bounty, I finally had an excuse to make it. This recipe was originally a plum clafoutis by Syrie at Taste Buddies. I've adapted it using strawberries in the recipe below, but it would work well with most any summer fruit. Also? Before you start, make sure you know that castor sugar is not the same as normal sugar! I wound up making my own castor sugar by whizzing granulated sugar in the food processor for about a minute, which seemed to work just fine. A lovely special occasion breakfast! p.s. As I was typing up this post, I realized I forgot to add in the milk when I made the clafoutis. Oops! If it was delicious without the milk, I'm excited to find out how much better it can be when made correctly! 2. 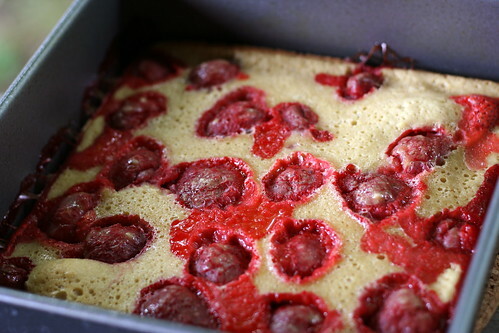 Grease an 8-inch square baking tin and arrange strawberries in the tin. Set aside. Beat the eggs well in a small bowl. Set aside. 3. Sift the flour into a large mixing bowl. Add a pinch of salt. Stir in the well-beaten eggs until mixture is smooth. Add 1/2 cup of castor sugar and vanilla and stir to combine. Now add the milk, stirring continuously until batter is smooth. 4. Pour the batter over the berries in the baking tin. Bake for 30 minutes and serve immediately. It's funny that you'd eat clafoutis for breakfast, since it's a classic French desert... Interesting, food differences between America and Europe. 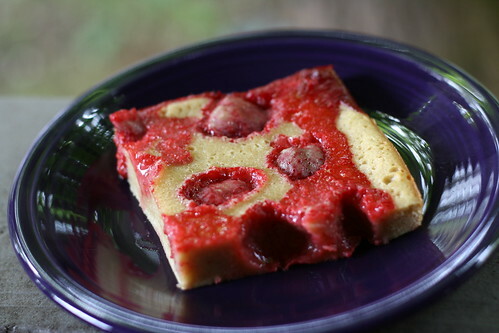 Ive never had STRAWBERRY clafoutis!!! great idea! I just picked 3.3 lbs. of strawberries and am going to make this (we're a little low on milk, but it seems like that's OK)!! I hope Tim's hungry.